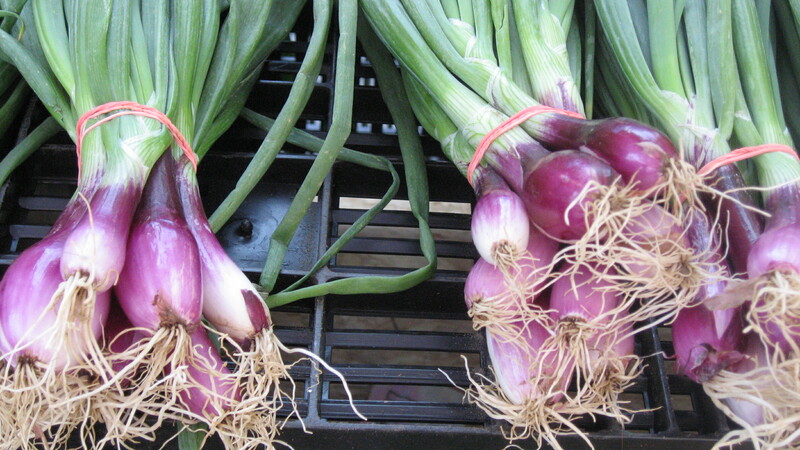 Last Sunday, I visited the Carroll Gardens farmers market around one o’clock. The Carroll Gardens market is located on Carroll Street between Smith and Court Street. Since I missed Grand Army on Saturday, I decided to utilize my Sunday and do a bit of Greenmarket shopping. The fact that Carroll Street is a leisurely stroll from my apartment on Baltic Street doesn’t hurt either. My first stop at the market was Hodgson Farmers where I picked up some lively Snap Dragons. They were just too pretty to resist. As I made my way down the block, I said hello to the farmer at Farm Tello Green and purchased one dozen large eggs. 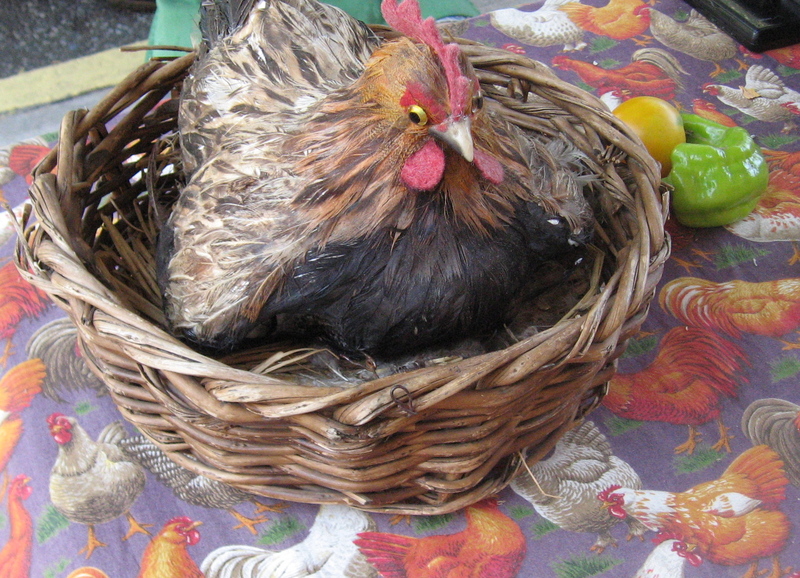 The farmer’s table was covered with a chicken print tablecloth. 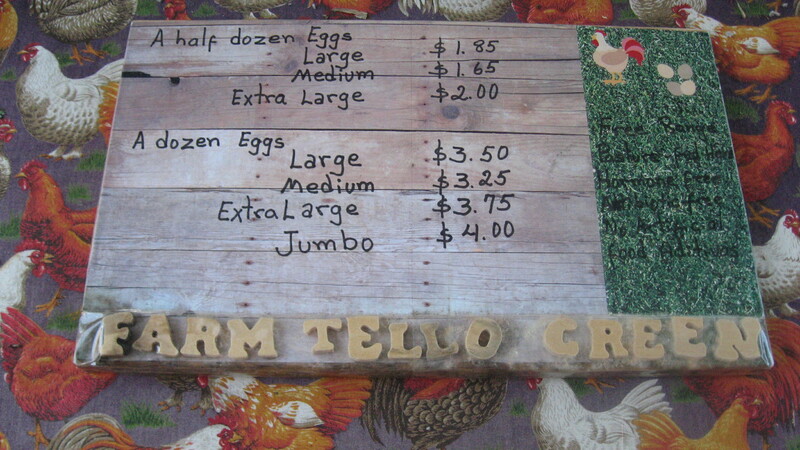 I admired the farmer’s hand-made sign, which included a few stickers of a chicken and eggs. In case you wondered where eggs came from . . .
Next in line was Fresh Radish Farm offering among other tasty things green onions and bunches of carrots. Just after Fresh Radish, I came to Consider Bardwell Farm. 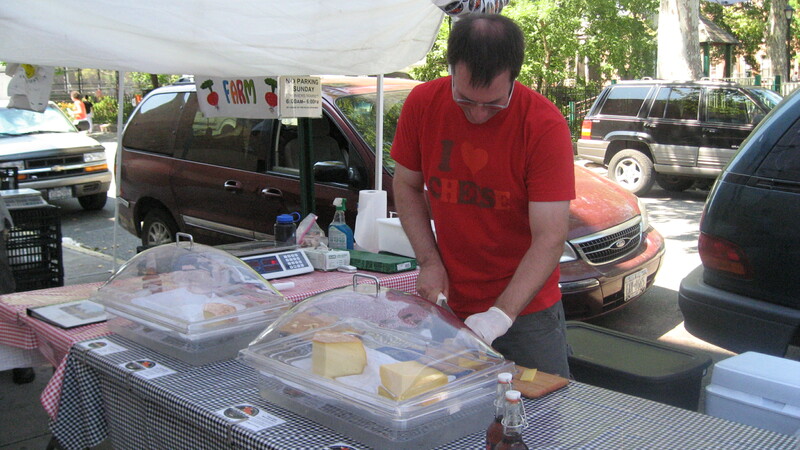 One of the cheesemongers was wearing a bright red t-shirt that said, “I Love Cheese.” Well, he and his friend were having a good time and handing out tempting samples of their Dorset and Pawlet cheeses. In case you were wondering, the t-shirt was purchased at a market in Soho. The samples were a hit so I picked up medium slices of both cheeses and a bottle of Maple Syrup. Consider Barwell Farm is located in West Pawlet, Vermont, so I am impressed to see them in Brooklyn. 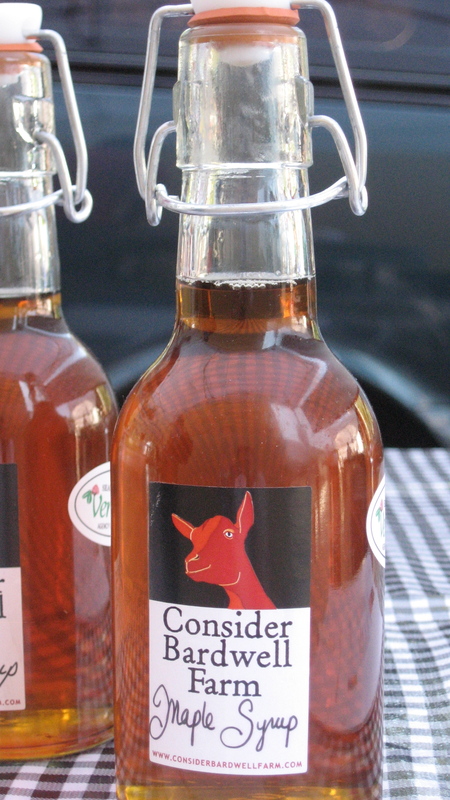 Visit http://www.considerbardwellfarm.com to learn more about their goats. Alex Farm’s tables were covered with beets, baby onions, lettuce, cucumbers, zucchini, blueberries, cherries and more. The last stop of the day was Seatuck Fish Company – where I was greeted by a friendly fisherman who happily introduced me to that day’s catch (or what was left of it at such a late hour). The first to go were the live blue claw crabs because the fisherman informed me they would not have made it alive to see the afternoon in the sweltering heat. My tardiness caused me to miss out on the scallops, black fish, and steamers. I was in luck with the flounder, blue fish, sea bass, swordfish, tuna, squid (cleaned), clams, oysters, and mussels. I was somehow talked into the whole (but smallish) sea bass and went for half a dozen oysters as well. Okay, this is going to be fun, I thought. I am going to gut this thing myself. How hard could it be? When it was time for me to cook dinner, I pulled out the sea bass and decided it was best to get my brother-in-law Sam on the phone. 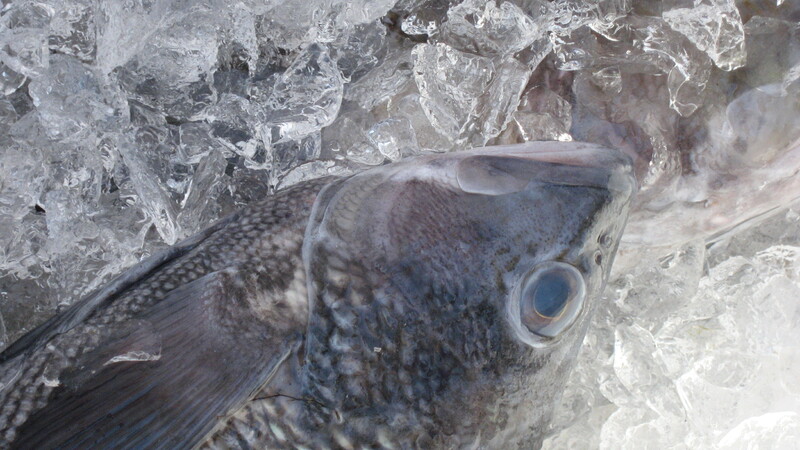 He basically then went on to describe the same process as the fisherman from the farmers market, “You just slice into it and then scoop out the guts.” We’re talking about two steps here – slicing into it and scooping out guts. I mustered all my courage and grabbed onto the fish jabbing my knife into him. Once I had made a bit of headway, I reached for a spoon, yes a spoon. I don’t know what chefs use, but it was the nearest utensil in reach so I went for it. The scooping went on for a while until I got too squeamish and asked for a little help from Jonathan who helped me finish the job. The rest went really well from there. I cleaned it and made sure the inside was free of blood and guts and then stuffed it with sliced lemon and parsley and poured about ¼ of a cup of olive oil on top. Then, I wrapped it in some foil and put it in a 400 degree oven for half an hour. It was delicious and the only problem was that we could have used another one. I’m going to Carroll Gardens tomorrow because I am in dire need of milk and need to put my newly purchased ice cream maker to good use. Welcome to Brooklyn Farmer. I started Brooklyn Farmer out of a desire to start a dialogue with farmers about where our food comes from. While Brooklyn might seem like an unlikely place to talk about farmers, the borough boasts ten farmers markets from Greenpoint’s McCarren Park all the way south to Sunset Park. Visit the Council on the Environment of NYC at www.cenyc.org for more details. As the summer months quickly approached, I realized July would be an opportune time to launch Brooklyn Farmer. All ten of the Greenmarkets in Brooklyn are now open. 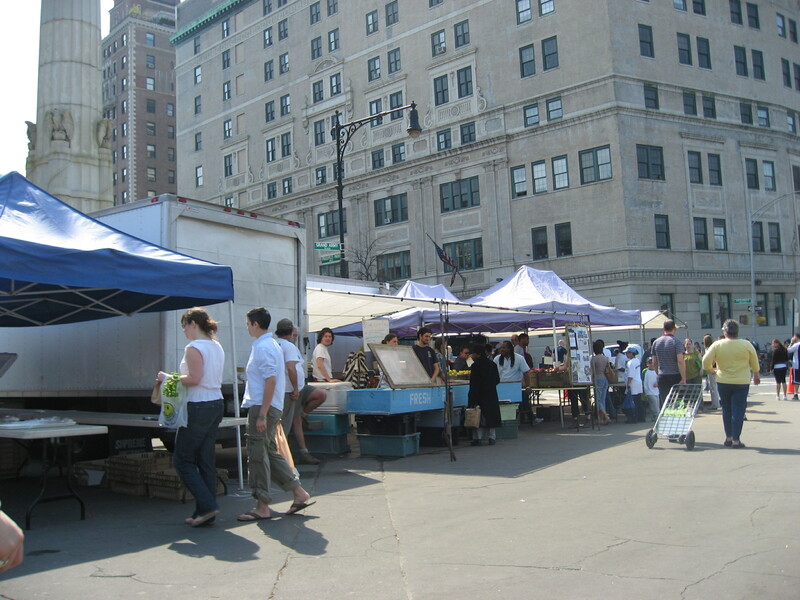 Year round markets include Greenpoint – McCarren Park, Fort Greene Park, Brooklyn Borough Hall, and Grand Army Plaza. Windsor Terrace opened in May. Carroll Gardens and Cortelyou opened in June. Williamsburg, Borough Park, and Sunset Park opened in July. So far, I have primarily been shopping at Grand Army Plaza (more on Brooklyn Borough Hall and Carroll Gardens later since they are closer to me in Cobble Hill). Grand Army Plaza is open year round, every Saturday from 8:00am – 4:00pm. Make sure to sign up for the e-mail list at www.grandarmyplaza.blogspot.com. Every Friday I get an enticing announcement in my gmail letting me know just what I’m going to find at the Grand Army Plaza Greenmarket. The e-mail serves as a much needed reminder about why I’m getting up at 8:00am on a Saturday Morning. So far, there have been the occasional Saturdays when it just doesn’t happen. The premise for starting this blog is that I will bike to all ten farmers markets throughout the summer/fall months (maybe train during the winter months and then we’ll see about spring), introduce you to the farmers there, and then cook from that day’s local food finds. I hope to help make shopping at farmers markets and cooking seasonal food less intimidating. I hope Brooklyn Farmer will encourage farm hungry eaters everywhere to go out and meet their farmers. You are currently browsing the Brooklyn Farmer blog archives for July, 2008.